When he was twenty, Nuyen travelled to France. There he met artists who painted in the Romantic manner, with strong contrasts of light and shade, intense colours and a sense of drama. Nuyen became fascinated with this style of painting and soon emerged as Holland's leading Romantic artist. This painting is a good example of his work, with a ruined castle, a dead tree blown down by the wind, clouds scudding across the sky, and shadows darkening the landscape. Nuyen's work was innovative and exuberant by Dutch standards. SPECIAL NOTE : The painter will make the reproduction as close to the original oil painting as possible. 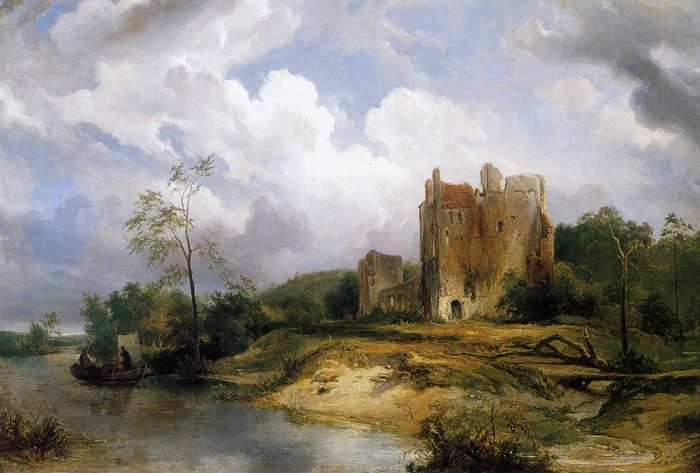 If you want your painting to alter from this likeness, please email us and " River Landscape with Ruins, 1838 " will be reproduced according to your special requirements.